A really really long day hahaha, still now i haven't bathed ... my bros are inside ... damn. So i'm blogging now. 7am - 11pm, i must really stink hahahaha. Let's tok abt today's stuffy. First had BB tut, it was fun as usual, went nutty with my grp mates, only we had 3 brains instead of 5 lol. So we made some mistakes for our assigned questions heh. 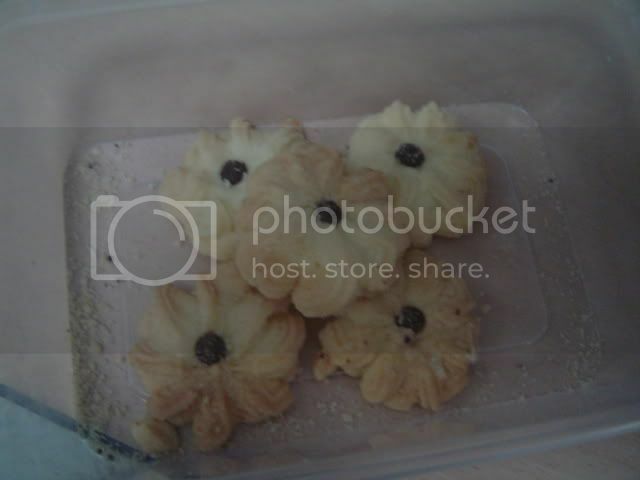 Then ZY gave me a box of butter cookies! I ate 2-3 pieces then i got 'sick' of it, cos it's a little too buttery for my taste. But it's good la lol. I kept teasing ZY that 'Wah buy de izzit.' LOL then she whacked me. Next i said, 'Your mum did one izzit.' LOL. She whacked me again. Then she finally said she got help ok lol. I mumbled yeah ... helped in eating haha. I dun think she heard it though XD. Here's the pic, left 5 only lol, i went to my aunt's home then she had around 3-4 and she said it was good. Then i showed my bros then they took 2-3 each hahaa. I quickly took pic b4 they ate all of them hahaha XD. Ok after BB tut we had SMM tut, it was ok la, lol juz that the grp behind us is really noisy LOL. Esp ahem ahem S. LoL, i was like 'Ehhh, quiet down le, people doing question le.' LoL, then i think HQ said something like cannot switch S off de then i went, 'Then pull the plug out la.' LoL. Boy, they are reallly noisy haha. But we're also noisy in our own little way too but not as noisy as them XD. Hahaha. After SMM, waited for ZY to copy my SMM lec notes ... then left to the mosque in Bukit Panjang to do my BB surveys ... managed to get 1, kena rejected twice and got 60+ malays 3 times so i got pissed off and wanted to go to Yishun. So i waited for FREAKING 20MINS for 171 to come. I got pissed off, then called my aunt cos i need a Chinese 30-34 and my uncle is tat age so i went to her house and she helped me do lor. Then i still need 2 malays ... 40-49 de so my aunt helped me ask her neighbours lol, really funny. Now i know the 'usefulness' of living in HDB ... ask around and they'll help ya ... sigh. I finally finished MY BB SURVEYS YAY I LOVE MY AUNT!!!! She's so helpfulllllll!!!! LOL. I went to try to fix her PC but failed. The modem is crapped up, the display monitor too, then i recommended she buy a new one. Then she told me no money. So i proposed to give her mine when i buy a new hard drive haha then my PC useless le hahahahaha. After going to aunt's home, mum asked me go for facial wash in Khatib. Manz, i'm scared of going for facial washes. U know why? Cos the auntie will squeeze my blackheads out and IT FREAKING HURT OK! I CRIED TODAY WHEN SHE DID IT. I really cried. I was like hic-cuping ... auntie so nice gave me hot water and sweet to eat. Kaoz, so ... embarrassing. I dunno why i cried. Out of pain or relieve or stress? ... I dunno. Then auntie like said she's done then i started crying. My tears kept flowing like water tap lol, then i suddenly cried. God. It's been like ... 4-5 years since i really cried and my whole body started to jerk and stuff. Usually when i watch anime, i cry but i dun jerk and make tat 'hic hic hic hic' sound haha. The whole crying thing lasted for around 10-15 mins ... i'm still tearing when i got on daddy's car hahaha. Then my bros, dad, mum and aunt were quiet throughout the ride then i was like hic-cupping the whole time. Hahahaha. But i feel alot better. My stress, body felt lighter. God. Then we went Ang Mo Kio ... woot, i saw SK jewellery shop and YanZi posters and faces are everywherrrrrrrrrrrrrrrrrrreee lol. I was like standing in front of the shop for 10mins hahaha juz staring at YanZi's faces. Then i took a brochure from the SK shop XD. We had a heavy dinner lol, i had chicken cutlet, my bros too, then they called another bowl of meatball noodles, porridge and Laksa to share hahaha. They really can eat sia, i was like i can't even finish my plate of chicken cutlet ... haha. But overall it was fun la. We went to some wet market then ... the smell of pork and fishes almost made me puked wat i ate hahahhahaha. So got home at around 11pm and juz right for Samurai 7!!! After tat i sent the LAM data entries to J, i promised to send at 10pm ... -.-|| Opps. Haha. Oh yeah, today is the first anniversary of my animes/manga/yanzi/and my crappy life blog!!! WHEE! I started on 27th Jan 2005 ... and now it's been a year. Thank you for supporting me yay.